Updated on 2017-05-01 – A lot of people think that knee braces are only for people who have injuries. Although this is often true, a lot of athletes use knee braces, or some other sort of knee support, during competitions or even just regular exercise if they feel that their knee(s) are unstable or even if they feel a small amount of pain. Keep reading if you would like to know what the best knee brace for running is. This post will concentrate on the different knee supports that you can use while running, which just happens to be my favorite pastime these days. Unfortunately, at some point most runners will experience some form of knee pain during their running career, or possibly even an injury. If you are reading this post, chances are you love running as much as I do, or maybe you just believe in its benefits. To avoid having to stop running because the pain gets too unbearable, or to avoid future injury, it’s important that you find the proper knee support that will let you keep going. To do that, you need to understand where pain from running comes from. Mechanics – Are you flat footed (no arch)? Are you over-pronated (foot rolls inward) or over-supinated (foot rolls outward)? If so, you may need custom fitted running shoes or at least custom-fitted arch supports. You are using the wrong equipment – It may be time to change those smelly old sneakers in for a brand new pair. The rule of thumb is to change them every 400 miles or so of wear and tear, whether you are running or simply walking. Also, I highly recommend that you get fitted by a professional. You will pay more for it up front, but the benefits on your body are immeasurable. Frequent change of terrain – If you change the terrain you run on too often, it can take a toll on your knees. Consider easing into a new terrain slowly. For example if you switch from street to rugged terrain, consider running a shorter distance the first few times out. Only you, with the help of a certified professional, can determine which one is best for your you. You should always consult a doctor to determine the best knee brace solution to support your particular situation. Have you had any experience wearing knee bands or braces while running? If you have, we’d love to hear about it! 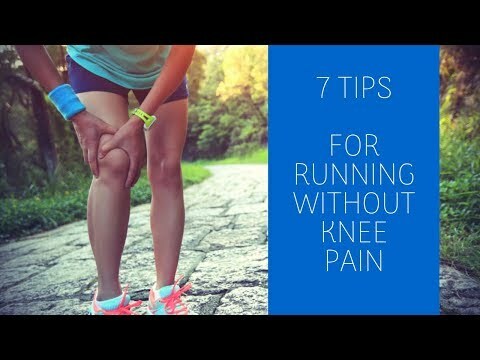 Updated on 2017-05-01 – Added a video which provides tips on how to avoid knee pain while running. Do Knee Bands Really Work? Brace is very useful in competition. Txs, just what I was looking for! My dad is 65 and he can hardly go up or down stairs. What is the BEST knee sleeve. I like the running sleeve. He also has a hard time getting in and out of his vehicles. He’s bought a gym set but his knees hurt too much. Hi Linda – Genutrain makes amazing knee sleeves that might be able to help your dad, depending on what type of injury or symptoms he has. Have a look at their diagnosis chart here to give you a better idea on what the different models can do: http://bit.ly/2fxZnP8. Amazon usually has great sales on Genutrain knee sleeves, just keep checking back here once in a while: http://amzn.to/2ehe9nq. One more thing, by the sounds of it, he might need a little more support than a knee sleeve. At his age (not always, but often) it could be related to osteoarthritis. There are knee braces that can help by unloading some of the pressure, however he should confirm with a doctor beforehand. I love my KneedIt knee guard! Never run long distances without it. Thanks for the feedback Jennifer. Yes, the KneedIt is a great product, especially for Runner’s Knee.